Fast Food and Mini Store in Old Town Sacramento Tourist Area! This walk in fast food restaurant located in historic town, is one of the famous visit points for the tourists in Sacramento. 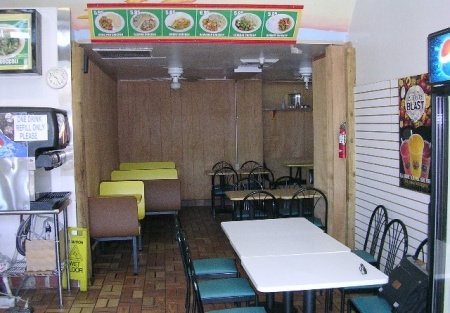 The restaurant serves Chinese, Vietnamese, Sandwich, Burger and Fires to go. This restaurant has a super clean clean dinning room seating up to 30 customers. They also sell cigarettes, ice cone, fruit box, candies, beverages in the store. The kitchen is equipped with a walk in-cooler, hood, deep fryer, stove and a Chinese wok. Facility has about 900sq/ft, base rent is $2970 per month with 2 years left on the lease. Seller is planning to purchase a business closer to their home to make it easier to care for their children. This is a Paramount Restaurant Brokers, Inc. DBA SellingRestaurants.com listing. This Facility Could Convert to New Concept. Every Weekend Events Attract Tourists in the Area. Kitchen Equipped Hood and Walk in Cooler. Store Sales Cigarettes, Beverages and Candies. Base Rent is $2970 a Month. Two Years Left on lease.